I’ve been building my brand in the digital space since 2008. and my specialty is teaching digital influencers practical ways to manage their online businesses. As a digital influencer email will be your my primary mode of communicating with your customers and clients. On any given day my inbox has over 2,000 emails that are unread, pending action or archived. With so many emails it can be overwhelming, but not if you have a system in place. 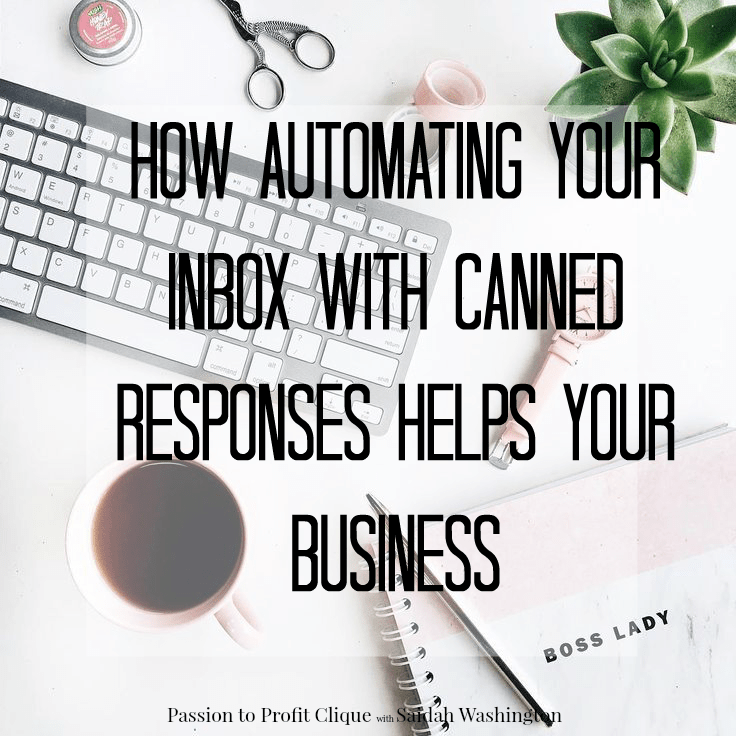 Today I’m going to share one of the systems I use to communicate and effectively, keep my inbox organized and save time. In my Passion to Profit Clique Facebook group, we talk a lot about creating systems that will help your business flow smoothly and create less work for you. If you’re not in the Clique, but want to grow your brand and make a full-time income doing so, you should be. Tap this link to join my Clique. When you decide to blog professionally, lots of emails come with the territory. Of the 2,000 email in my inbox many of them are filed emails from partnerships or sales. I partner with an average of fifteen brands a month and with those partnerships comes a lot emails back and forth. One of the systems I have in place are canned responses. These canned responses are especially helpful when pitching brands and responding to pitches. I have my pitches and pitch replies a,one other responses saved as canned responses. Tap this link to learn more about how to pitch brands and get paid partnerships. Having a system in place to manage communication is paramount to saving time in your business a digital influencer. I create a video sharing my process for reading and instantly responding to emails using Gmail’s Canned Responses feature. Canned Responses is a feature that will help you reply to emails faster using email templates. The templates can be set up to respond to any type of email. I use my templates to respond to pitches from Public Relations brands, to thank customer who personally reach out to me and to send pitches to brands for partnerships. – How to set up canned responses. – How to use a canned response template. – How to edit, save and delete a canned response. – Plus you’ll get some ideas on which email templates will work for your digital business. I love teaching through video and blog posts. To make sure you don’t miss when I release new content, subscribe to my channel and join my mailing list. I also stream live in Friday’s in the Passion to Profit Clique so tap this link to join. Are you a female Blogger? Join Passion To Profit Clique, a private FaceBook group where bloggers learn how to make income with affiliates, ads, product creation and sponsored content.